Star Wars has had a strong Christmas connection since the release of the Star Wars Holiday Special in 1978. When a new Star Wars film is released, it normally happens in December which is an awesome gift to millions of fans out there. We got into the Star Wars Christmas mood this week, in honour of the release of Star Wars: The Last Jedi, when we made gingerbread Wookiee Cookies! Since 1977, every Star Wars film has been a summer blockbuster release. On December 18, 2015 Star Wars VII: The Force Awakens will mark the first time in the franchise’s history where a film will see a Christmas release. Some fans have protested the decision to move the release of the film from the traditional May date, but many more have welcomed the change, feeling that Star Wars has always had a place at Christmastime. Merry Force Be With You! Beginning in 1978 with the Star Wars Holiday Special, Lucasfilm has embraced the holiday shopping season and released toys and special Christmas merchandise for fans of all ages. A few years later, in 1981, George Lucas commissioned a painting by Star Wars artist, Ralph McQuarrie, for a personalized Christmas card that was to be sent out to the entire cast and crew on Star Wars V: The Empire Strikes Back. 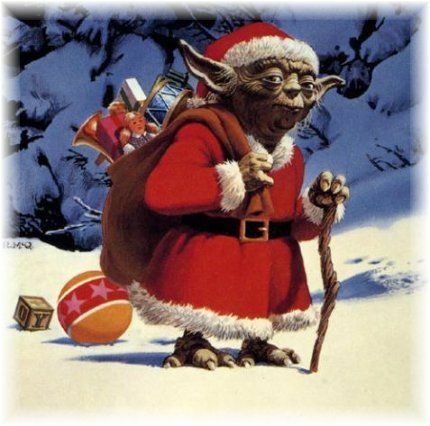 McQuarrie’s depiction of Yoda in a Santa outfit would become one of the most iconic Star Wars Christmas images ever produced. This image is still used today for Christmas ornaments . . . and even a stocking or two. So, anyone who considers him or herself one with The Force will know that Christmas and Star Wars go hand in hand like peanut butter and jelly . . . or Stormtroopers and candy canes! 2017 Défilés du Père Noël au Québec! *Note: Only select items available at our Toronto kiosk locations. Distillery District kiosk carries NO Ugly Sweaters, while the City Hall kiosk carries MOSTLY Ugly Sweaters. Full range of products available online and at our Oakville store. If you love Christmas, you'll love our blog full of Retro Festive Fun!